To make Char Dham pilgrimage safe and convenient, Prime Minister Narendra Modi laid the foundation stone of 900 kilometre long Char Dham Highway Development Programme in Dehradun on Tuesday. After laying the foundation stone for the mega project, the Prime Minister said that the long over due project will help lakhs of people by creating employment opportunities, boosting tourism and strengthening the local economy. He said that people will remember the Union government as Shravan Kumar a historical character who finds mention in the Ramayana and epitomises devotion towards parents. Every year thousands of pilgrims from across India and beyond its shores visit the four abodes of Gangotri, Yamunotri, Kedarnath and Badrinath in Uttarakhand. But the highway network along Char Dham got severely devastated following the cloudburst in 2013. And this badly affected the influx of pilgrims. Narendra Modi-led government at the Centre has taken the onus of making the pilgrimage safe and convenient for pilgrims. 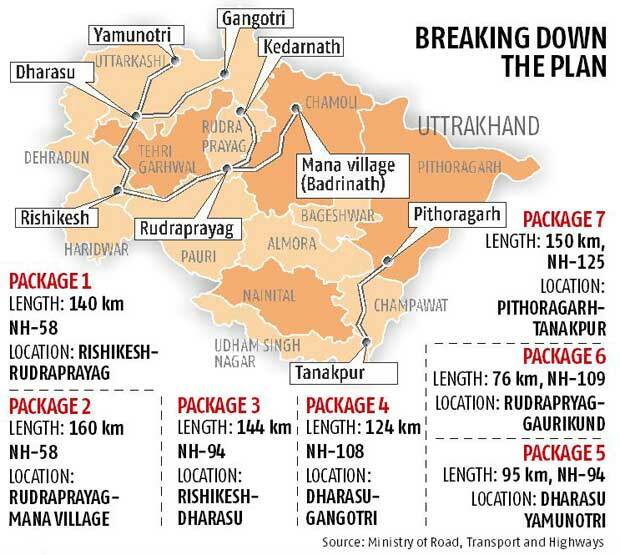 The main objective is to develop around 900 kms of national highways at an approximate cost of Rs. 12,000 crore. Around Rs 3,000-crore project has already been sanctioned. Currently, the route to the four shrines is not only arduous but also accident prone. Now, the Centre has taken up the initiative to make the route safer. Under the project, 132 bridges, 25 high flood level bridges, 107 maner bridges, and 13 bypasses will be constructed on the 900 kilometre long national highways. At 38 landslide-prone places, protective layers will be created through steel sheets. Environment friendly and modern techniques are being incorporated in the design to make these zones safer. Roadside facilities will be available at 18 places there will be 145 bus bases and 9 truck bases. Local residents and tourists have welcomed the initiative of the Centre. The project will be an all-weather highway project which promises to infuse a sense of safety among pilgrims and create jobs for locals. The government aims to make the project that will cut travel time by 30 to 40 percent environment-friendly. The project is significant from a strategic point of view too as it is expected to quicken supply and deployment to defence establishments along the Indo-China border areas in Uttarakhand. A target has been set to complete the project by 2020. Upon completion, this milestone in development of Uttarakhand promises to come as a boon to the people of the state.